Joseph Campbell is a Partner in the Commercial Property team specialising in commercial Landlord and Tenant, commercial freehold and leasehold acquisitions and disposal and secured lending. Joseph’s expertise includes working for a range of clients from individuals to SMEs and PLCs in both leasehold and freehold transactions and acting for a number of high street lenders in commercial property finance and re-finance. Joseph also has experience of negotiating and advising upon heads of terms, options, leases, variations, surrenders and renewals. Joseph also has many years experience in dealing with property aspects of both insolvency and corporate transactions. 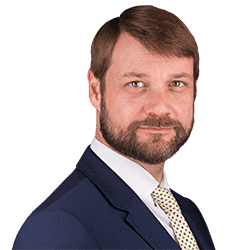 Joseph Campbell qualified as a Solicitor in May 2003 and later joined Clarke Willmott as a Partner in 2017, after working for a number of years at respected local and regional firms in the South Coast region and previously within the West Midlands. Acting for commercial Landlords and Tenants in new and renewal leases, including acting for a national technology company in the renewal of their head-office lease. Joseph has a strong reputation for commercial lending institutions in secured finance transactions, ranging from relatively small value lending to multi-million pound advances, including acting on behalf of a high street lenders in ensuring security over property assets. Joseph has experience in acting in the sale and purchase of all types of commercial property, including the negotiation of multi-million pound, multi-site property disposals and acquisitions.